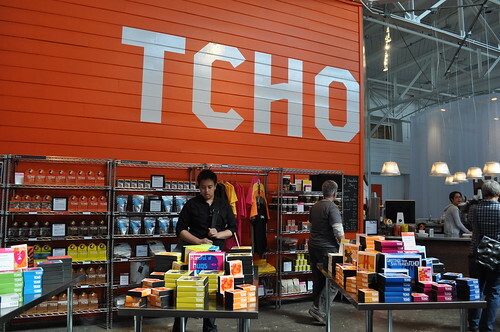 After seeing TCHO Chocolate in Whole Foods Market, and again in a post on Oh Joy!, I discovered that the chocolate company was based in San Francisco and gave free factory tours. So I immediately made a reservation to participate in a morning tour through Brown Paper Tickets during one of our days in San Francisco. Outside TCHO Chocolate Factory at Pier 17! 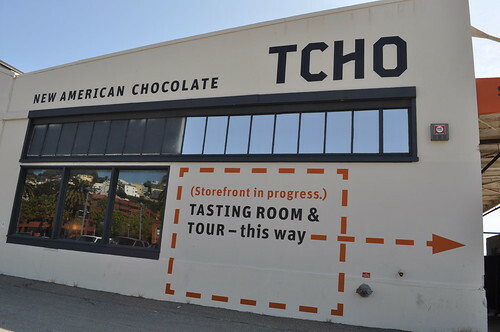 So a little about TCHO: it is a "new kind of chocolate company"--where Technology (i.e., a "Silicon Valley start-up) means CHOcolate (in "San Francisco food culture"). TCHO was co-founded in 2005 by Timothy Childs, a NASA space shuttle contractor, and Karl Bittong, a 40-year chocolate industry veteran. Two years later, Wired magazine co-founder, Louis Rossetto, joined TCHO as the CEO, and two years after that, Jane Metcalfe, Wired's other co-founder, joined as President. 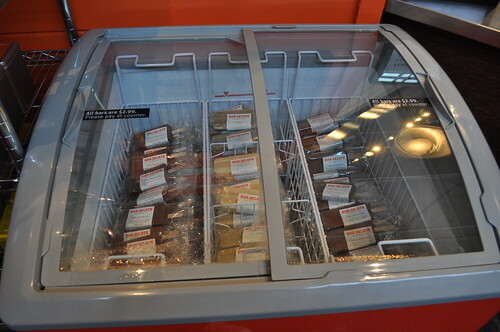 TCHO Chocolate isn't remelted--it is manufactured in its own factory (where we visited). Its primary focus is a "direct, transparent connection between the farmers and the consumers, from the pod to the palate, from high concept to sensual experience." TCHO also wishes to help the public to become a knowledgeable enthusiasts of chocolate, as context and meaning are important to enjoying chocolate. In fact, TCHO has developed a new method (taxonomy--what it refers to as its "Flavor Wheel," which I will explain more later) to help one find the chocolate he or she likes, using common sense descriptors like Nutty, Fruity, or Chocolatey. 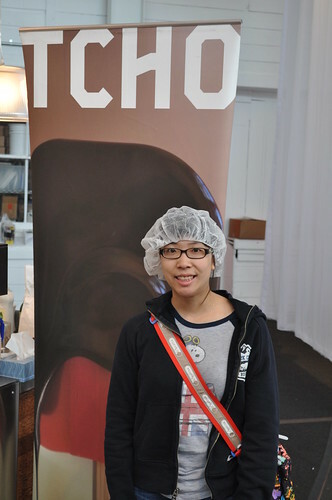 Me at TCHO in a hair net, prepping for the factory tour. During the tour, our guide gave us an in-depth oral and visual presentation surrounding the process behind TCHO's history, culture, its company, and of course, its chocolate manufacturing process (i.e., production through packaging). What I found most interesting was when she went over the "Flavor Wheel" and how it plays into what TCHO stands for. 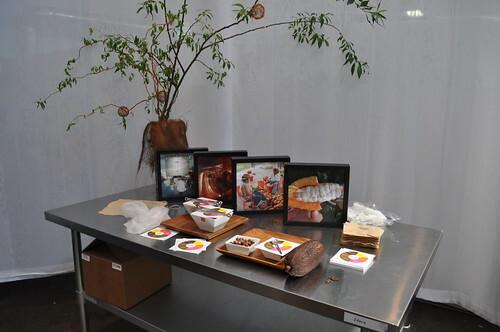 She shared with everyone that TCHO’s core product principle is flavor--it uses its original "Flavor Wheel" to tune each of its chocolates. It is also TCHO's "roadmap" as it hunts the world for the beans it needs to fulfill this wheel. The "Flavor Wheel" also serves to help discover your chocolate in a common-sense way! I'll share more about how its chocolate tastes in relation to this "Flavor Wheel" when I get into the chocolate tasting we had while we were at TCHO Chocolate Factory. She then guided us through the actual factory (pretty sizable), with all participants donning hairnets and all. As it was a Monday morning, the factory was in full swing--production through packaging! After the tour, there was a tasting of the five kinds of chocolate produced by TCHO. Before we got to taste any chocolates, however, our guide took the time to explain to us its technique of tasting chocolate. First, break the chocolate and make sure you hear a nice, crisp "SNAP!" Then, rub the piece of broken chocolate on your fingers--this is to help release the chocolate's inner aroma as well as to bring it to room temperature (i.e., the optimal temperature at which to each chocolate). Next, put the chocolate into your mouth, and try not to chew. Let it melt onto your tongue, so you can savor the flavor more thoroughly. Our guide said TCHO likes to look at chocolate tasting just like wine tasting--with a certain set of taste criteria. To start the tasting at TCHO, we had roasted nibs, which are small pieces of crushed, roasted cacao beans, sourced from Madagascar! These roasted nibs showcase the outstanding quality of TCHO's cacao beans, as they are the same beans used in TCHO's "Citrus" chocolate bar. What is worth noting here is that few chocolate companies make nibs, and if they do, none use their very best beans. At TCHO, these nibs are roasted and processed meticulously to coax out the best of its delicate citrusy undertones. The natural roasted nuttiness of nibs adds a nice balance to these top notes as well. These were really bitter but had a nice crunch to them, reminding me of espresso chips! TCHO recommends its roasted nibs as an ice cream topping, salad topping, and even an ingredient to add to sauces! Second, we had a taste of the Chocolatey, TCHO's pure dark chocolate from Ghana. It is made from deep, flavorful beans, tending to have a malty, roasty, and earthy taste. I found this to have a very smooth bittersweetness to it. Next, we had a taste of Fruity, TCHO's chocolate full of bright red berry flavor, especially of raisins and prunes, from Peru. I found this to have a nice hint of fruitiness--not overpoweringly sweet, which mixes well with the dark chocolate at hand. Then, we had a taste of Nutty, TCHO's chocolate with the rich flavor of roasted nuts with hints of dark roasted coffee and toasted biscuit, also from Peru. Our guide said Nutty is more subtle than Chocolatey and Fruity--a slightly more complex type of chocolate. I like the fresh roasted flavor in this chocolate. Last, we had a taste of Citrus, TCHO's chocolate, from Madagascar, with a delicate cocoa flavor with a little surprise. Our guide told us that it evolves into "lively citrusy zing" on your tongue, ending with a smooth sour cream finish. It definitely was an interesting taste--I got hints of lemon and orange mixed in with the bittersweetness! TCHO is still on the search for Earthy and Floral to complete the flavors on its color wheel, but I know the will search to the ends of the earth to find the best chocolate to fit these attributes! We were led back to the Beta Factory Store, where all TCHO Chocolate is sold! 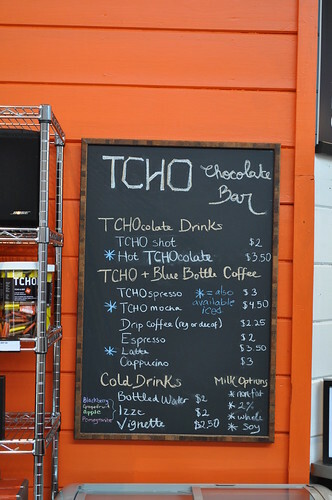 Along with the Beta Factory Store, there is the TCHO Chocolate Bar with special chocolate drinks, Blue Bottle Coffee, and assorted cold drinks as well as some sweet snacks! The current four "Flavor Wheel" chocolates are available in a set of commemorative Impressionist boxes--Edgar Degas, "The Dancing Lesson" for Nutty; Gustave Caillebotte "Floor Scrapers" for Chocolatey; Vincent Van Gogh "Starry Night Over the Rhône" for Citrus; and Paul Gauguin "Arearea" (Joyousness) for Fruity. As a huge fan of Modern Art, particularly Impressionist Art, I got a set of the four! Also, the cashier recommended these gelato bars to us, so we each got one for the road. Marcus got the TCHO chocolate flavor of Bar Gelato by Naia. 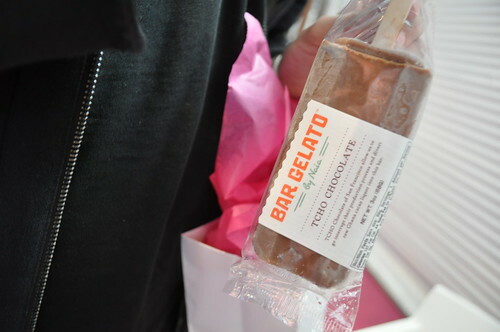 A nice smooth chocolate gelato in frozen bar form! I got the pistachio flavor. 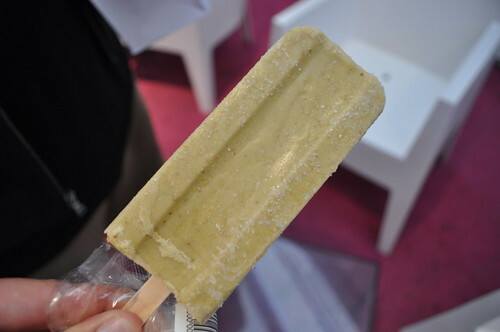 I really liked the gritty nuttiness to the gelato in this bar--you can really taste the roasted flavor of the pistachio nuts in it! Findings: I found the tour and tasting to be really informative and educational about the world of chocolate that I knew little about before visiting. It's incredible all the hard work put in by the people at TCHO as well as other respectable chocolate makers to make a really great piece of chocolate in a sustainable and friendly way. 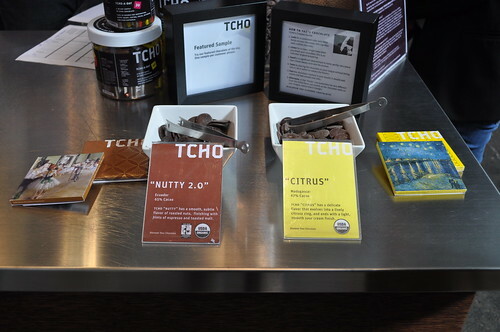 I thought TCHO's new approach to chocolate using its innovative "Flavor Wheel" can really appeal to the public, particularly with helping them learn about how to appreciate, understand, and taste chocolate. From the information presented in the tour and tasting, it is clear that TCHO is seriously committed to its cause and its product--something I really admire in this kind of new and innovative enterprise. I look forward to tasting Earthy and Floral. So if you're in town, chances are you'll probably make a trip to the Ferry Building and Fisherman's Wharf, and since TCHO is right in the middle of both, you should totally stop there, too! Plus, it's free, and totally worth the hour of your busy day--you'll learn so much! Price point: free for TCHO Chocolate Factory tour, $2.99 for each Bar Gelato by Naia, $21 for commemorative set of four Impressionist boxed chocolate.